When I first started playing SoD I did expansion quests without knowing they need expansions, ever since then I have never been able to get rid of the quest arrow. Pls add a way to decline quests after accepting them. Another good option would be to redo quests, but only get xp and coins and not the rare items like the whispering death egg and the dragon age up at the beginning of an expansion. This would make the game more fun since you can redo all the quests and also in case someone skipped the dialouge and wants to see it later. If redoing quests will not do then pls add quests more often. Dagger. Species: deadly nadder. Gender: male. Personality: Protective, Stubborn. Habits: forcing other dragons to do things. likes: fighting, dragon tactics, being the leader of something. Dislikes: dragon hunters, mildew, agressive dragons, slacking off. Icebreaker. Species: shockjaw. gender:male. personality: playful, obedient, childish, carefree. likes: arctic char, Stormfly, dolphins, friends, cold, tidal class dragons, racing, dragon tactics, any other SoD minigame. Granite. species: gronckle. gender: female. personality: carefree, calm. likes: slacking off, eating, sleeping, interacting with meatlug. dislikes: Dagger, Dagur, Hookfang, snotlout, astrid. Rockstar. species: groncicle. gender: male. personality: curious, careless, self centered. 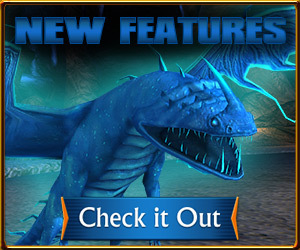 likes: darkness, water, burrowing dragons e.g whispering deaths. dislikes: light, fireworms, monstrous nightmares, flightmares, bioluminescent life. Rose & Violet. species: zippleback. gender: female. personality: mood springs. likes: vegetation, death songs, snaptrappers, dramillions, flamewhippers, other colorful dragons, butterflies. dislikes: when death songs try to eat her, deforestation. Wildstyle. species: monstrous nightmare. gender: female. personality: bold, energetic, careless. likes: fire, explosions, action. dislikes: being bored, sleeping. Reaper. species: whispering death. gender: male. personality: unknown. likes: unknown. dislikes: unknown. Bloodmoon. species: whispering death. gender: female. occupation: death. Deep. species: scauldron. gender: male. personality: variable. likes: tidal class dragons, friends. dislikes: being alone, too much heat, fireworms. Cash. species: doberman/boneknapper. personality: loyal, clever sometimes, usually acts stupid, excitable, cuddly, playful, needy. likes: food, playing, play-fighting, friends. dislikes: vaccumes, brooms, water. Inferno. species: typhoomerang. gender: male. personality: moody. Mt. dew. species: tide glider. gender: male. personality: spirited, competetive. likes: games, competitions, winning. dislikes: doing nothing unless it is a slacking contest, losing. That would be a way to get dragon XP. Well, to remove the quest arrow just go in the option page (Click on the little cog on the right of your screen) and click the little icon that says "no quest arrow" (It shows a little arrow with a bar on its front) so you wont have problems with it. Hope this helped you! I know how to do that but it still does not get rid of the quests in the quest menu in the journal. There are currently 12 users and 136 guests online.